the weather is beyond our ken is it not? today the wren shared the hommous with me. I am sitting on the verandah with a juicy warm autumn sun a carob drink a plate of hommous and a bunch of sourdough crackers thanks to anne marie the zero waste chef extrordinaire who you can visit here . this is what I do : soak the chickpeas for 24 hours,drain and cook them . keeping some of the water I put them thru the mincer and then add garlic salt tahini lemon juice some of the reserved liquid and a pinch or two of ground cumin which rob assures me is a vital addition.good enough for me good enough for the wrens. the superb blue wrens have lost their startling blueness, the breeding season is over and the fellas don’t need their bold colours anymore. it fades bit by bit like paint peeling off a wall over time and all that is left is a darkish blue tail and the motley brown grey scruffy look. a scruffy fella sups out of the dish once twice thrice and then skips off. they are all over the verandah around my feet pecking at morning toast crumbs and visiting the top of the table for a direct infusion of a chickpea paste. I barely move so entranced with this sharing but even when I do they don’t take a lot of notice. it has not rained for a couple of months or more and the land is drying out. 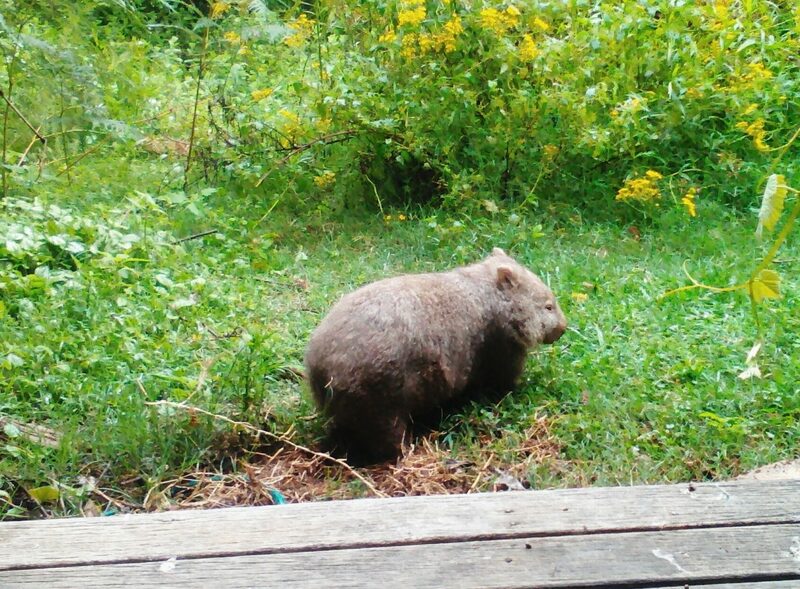 the wallabies drink out of a water pot in the garden and empty it every couple of days. the kangaroos are camping near one of our dams and it is getting lower . the conversation in the village is all about rain about wanting rain needing rain. jokes about rain dances and prayers for rain. heads are shaken- farmers sell off stock and water is bought – there isn’t anything we can do about this is there ? the weather is beyond our ken is it not ? hang on a minute -we still do. we use poisons which kills the bees and fertilisation of our food is becoming a problem . we cut down the forests and there goes the mist the cloud the dew the drops. early morning I walked in the autumn mist – yes the spiders had all their webs slung about . I stood watching the sun beams angling thru the trees highlighting the webs and reflecting upon the dam. I could hear and feel drops falling on me. not rain per se not a cloud above just trees and mist. we are connected to all of these things – we deplete our rivers and the landscape dries out we tear apart the mountains drain the swamps for suburbs rob the aquifers for mining projects, make armaments out of depleted uranium and have created enormous plastic/chemical sludge islands in our oceans. I heard a snippet on the radio this week from a writer who says, ” Man thinks he has left the Natural World, but the Natural World has never left us.” I’m paraphrasing a bit, but despite all the agony of plastic in the oceans and felling of every forest, Mother Earth is in control. Great shot of your feathered snacking companion. Hi rosie, a bit like the agony and the ecstasy – the plastic and the whale- always amazes me how so many disparate pieces can fit together on this spinning globe – we just have to buckle up and let go at the same time – the earth will determine And the human can help or hinder …..
but yes susan the overlay of the man-made destruction – it is a formidable thing to behold..